This prickly pear cactus transparency is inching along. I wait for the day when we will get to see this from the front side! Weaving from the back has its advantages, though. I am able to deal with all the weft tails as I go. In some rows there are as many as twelve or thirteen different weft bundles. 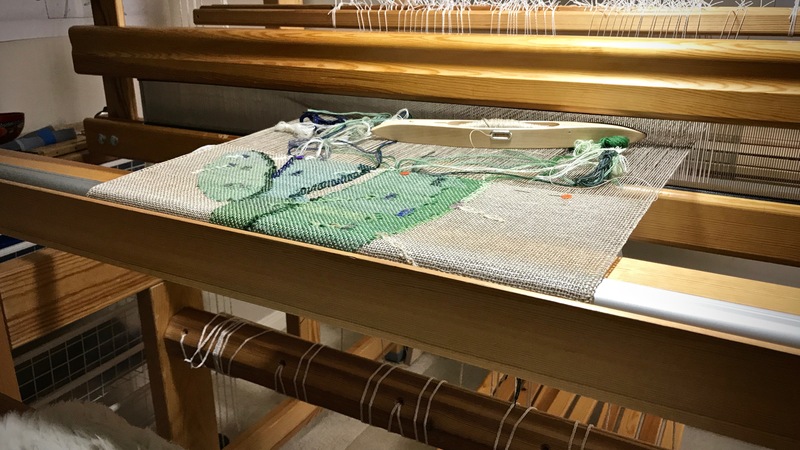 Every weft bundle has tails that are either tucked under adjacent warp ends, if possible, or woven in later with a needle. After every inch of weaving, I stop and trim weft tails. I use a blunt needle to weave loose tails in first before trimming them. This part of the process is time consuming. But I do it happily, thankful that I won’t have hours of tedious work at the end of the project. 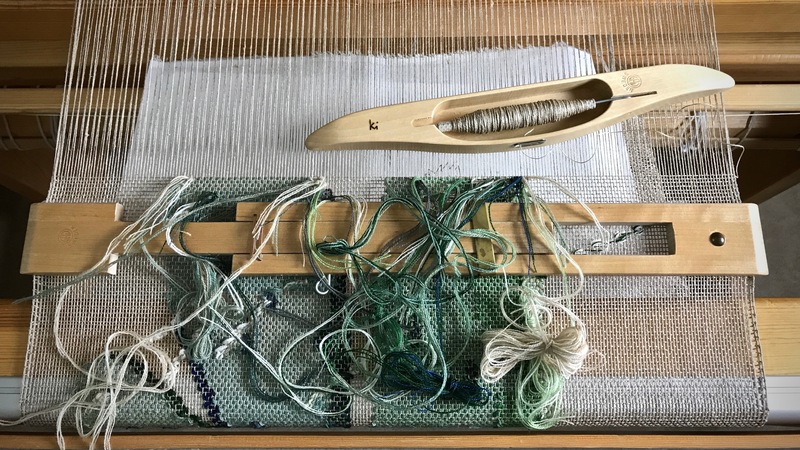 Each pattern row is woven straight across, from left to right, with weft bundles following the lines of the cartoon underneath. The linen tabby weft lies between each pattern row. An inch-worth of weaving, with weft tails to weave in and to trim. Wefts that were spliced while weaving can be trimmed close to the fabric. Tails of weft bundles must be woven in with a needle, and then trimmed. 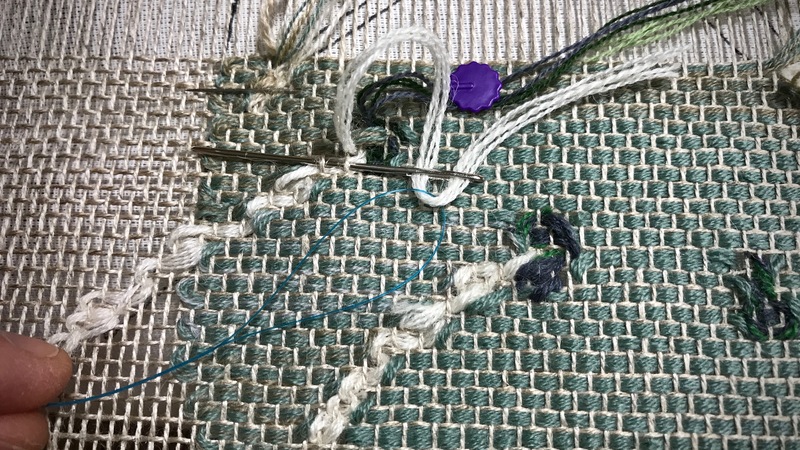 Sometimes it works best to put the needle through warp ends first and then use a dental floss threader to help thread the weft tail bundle through the eye of the needle. Cactus keeps growing, inch by inch! Give thanks. It is right and it is satisfying to give thanks to the Lord. The little things that we get to take care of now, daily inching along, are reminders of the big work in progress that we are in. Eventually, we will see the front side. And what a joy that will be! May all your loose ends be secured. The back side looks amazing! I can’t wait to see the front. I love this! Beth, It will be exciting to see the whole thing at once, too, instead of just a section of it. Cheryl, Thank you! I am getting so much enjoyment in weaving this. I didn’t know how much fun this would be! Do you try and tuck most of your ends under the warp that shows on the back? It will be interesting to see the clear picture when it is done. My sister-in-law and I were talking about tragedies and how God can make all things good. As in your transparency, we only see the backside of our immediate life picture, but how glorious it is as life goes on. We can only hope the messy parts of our lives will make an incredible impact in someone else’s life, to the glory of our Creator and Savior. Hi Jenny, Yes, I tuck most of the ends under the warp the shows on the back. Hopefully, all those little ends won’t be seen from the front. Also, all the weft turns are on the back. When we see the front, the turns won’t be visible and all the edges of the design will be much more distinct. Thanks for sharing a beautiful word picture of what God can do with the messy parts of our lives. We look forward to the day when we will truly see it from His view. 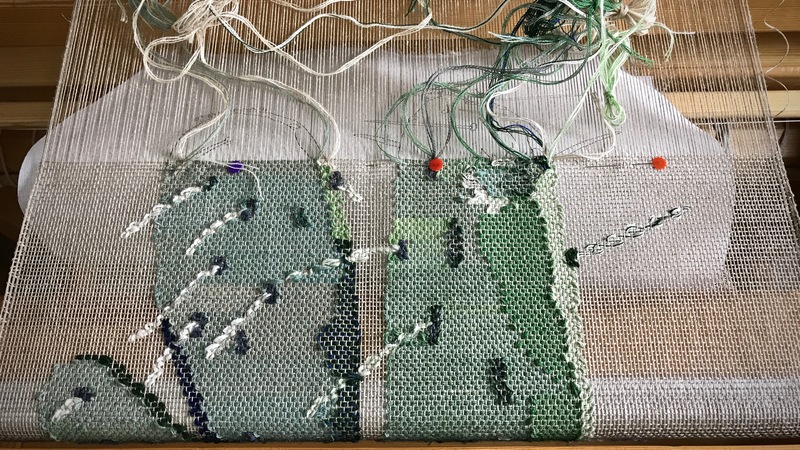 Looking at your transparency progress brings back so many happy memories of weaving these through the years, and encourages me to get another one started. Even though it is slow weaving, I’d always say “just one more row, and then I’ll stop”, it was so satisfying. I love how the cactus spines stand out! Can’t wait to see it hanging in a window with light shining through! Hi Lynette, I agree, this is so satisfying to weave. Oh, light shining through will be the icing on the cake! 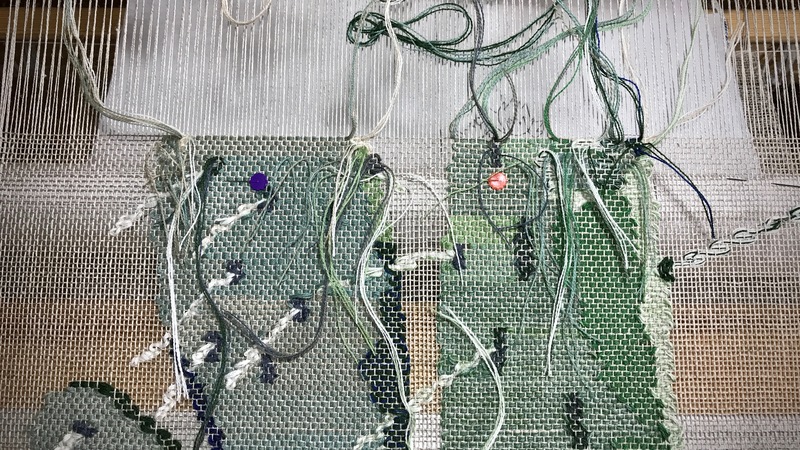 I love hearing your thoughts about weaving transparencies!